Today, Martin Luther King Jr. day is being celebrated, and I thought it would be nice to let everyone know about the first Buckeye Bullet. Sure, with our team, the BB1 is known as the world record holding electric car, but there's another record-setting Buckeye Bullet out there. 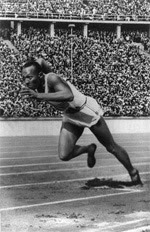 Jesse Owens was a sports legend, both to the world, and here at Ohio State. The Jesse Owens Memorial Stadium is home to our Track and Field team, to commemorate the man that set 3 world records, and tied a fourth, all in the span of about 45 minutes. (Read more from ESPN).